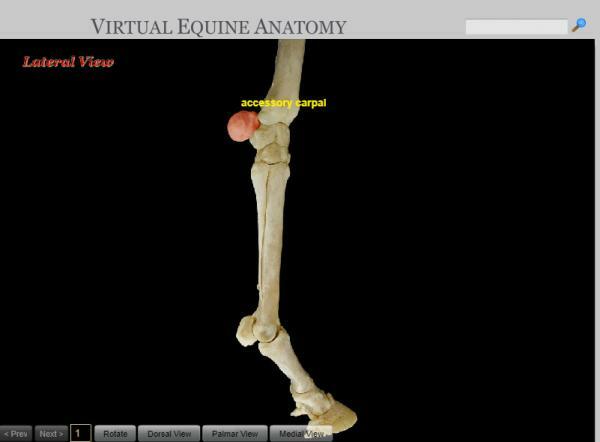 Virtual Equine Anatomy (VEA) is based on our first anatomy program, Virtual Canine Anatomy (VCA), and has the same interactive elements with illustrative photographs of equine dissections. As with VCA, radiology, osteology, musculature, directional terms, and surface anatomy will be covered in VEA. A common student comment in our outcomes assessments of VCA is a desire for dissections of additional species; we hope to meet this need with our equine program, and also with new bovine and feline programs. VEA is in the early stages of development.